I just want to thank you for NARP. I am sitting in the lounge. I’ve had a meal and a comfy seat. Waiting to board my flight with no stress at all. I enjoy this each time I fly regardless of what cabin I fly in. At my age it’s a very welcome bit of extra comfort. NARP50plus helped me with my business loan. As a food vendor in Akure, I needed some more capital during December , NARP50plus came through for me. I got a loan of NGN100k at very low interest rate. Thank you NARP50plus. I realized at 7am on this Saturday morning that I had run out of my prescription medication and placed an order with my-medicines.com by text. Though I thought I could just wait till my neighborhood pharmacy opens at 10 but I had things to do outside the neighborhood and felt I would give their services a shot since they also promise home delivery. I got my phone and made my request by text, quoting my NARP membership. Within 30 minutes I got a call back from one of their Pharmacists and she explained what had to be done. I did what I was asked to do – scanned my prescription and paid. Within an hour, my medication was at my doorstep and I was also given the 5% NARP discount. His Hands Outreach provides medical care to the elderly in Nigeria. My family engaged them recently and we found their services to be exceptional in every sense of the word. The nurses were very professional and competent and took personal interest in the welfare of their client. This is a highly needed service in Nigeria and I wholeheartedly endorse them. As a member of The Nigerian Association of Retired People NARP50PLUS, I got to utilize the service providers and they took care of my entire visit to Lagos. 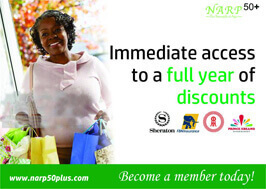 The services provided by NARP50PLUS were exceptional. My family and I needed a place to stay in Lagos for about 3 weeks, with a car and driver. They arranged a luxurious apartment in Ikoyi at a very reasonable rate. We had specific security requirements, and they were able to accommodate us. When we had some issues with the driver requesting more money than agreed, the management team stepped in immediately and found another car service for us with a wonderful driver. The drivers knew their way to the inter-land and they were very willing to work. I would highly recommend becoming a member of NARP50PLUS.